It’s true, a hot tempered person starts fights and a cold tempered person stops them. 1. Proverbs 21:23 Whoever keeps his mouth and his tongue keeps himself out of trouble. 2. 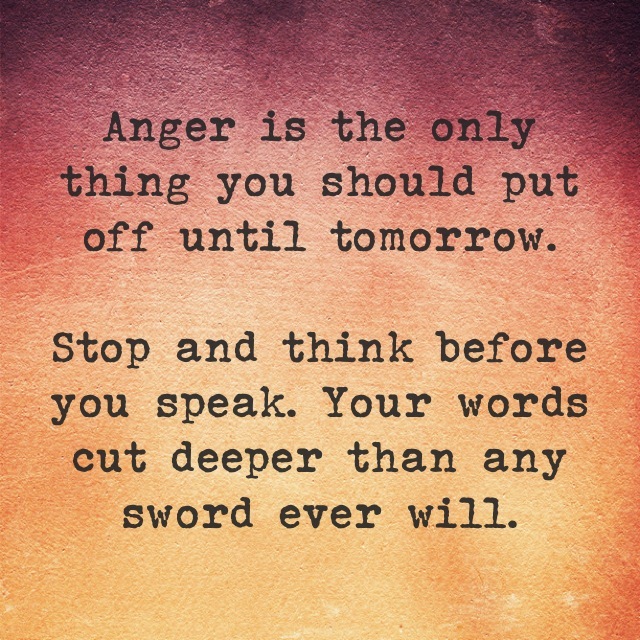 Proverbs 15:1 A soft answer turns away wrath, but a harsh word stirs up anger. 3. Proverbs 12:18 There is one whose rash words are like sword thrusts, but the tongue of the wise brings healing. 4. Proverbs 17:27-28 Whoever restrains his words has knowledge, and he who has a cool spirit is a man of understanding. Even a fool who keeps silent is considered wise; when he closes his lips, he is deemed intelligent. 5. Proverbs 18:21 Death and life are in the power of the tongue, and those who love it will eat its fruits. 6. Proverbs 15:4 A gentle tongue is a tree of life, but perverseness in it breaks the spirit. 7. Proverbs 10:19 When words are many, transgression is not lacking, but whoever restrains his lips is prudent. 8. Proverbs 17:9 Whoever covers an offense seeks love, but he who repeats a matter separates close friends. 9. Proverbs 6:1-3 My son, if you have put up security for your neighbor, have given your pledge for a stranger, if you are snared in the words of your mouth, caught in the words of your mouth, then do this, my son, and save yourself, for you have come into the hand of your neighbor: go, hasten, and plead urgently with your neighbor. 10. Proverbs 26:20 For lack of wood the fire goes out, and where there is no whisperer, quarreling ceases. 11. Proverbs 10:18 The one who conceals hatred has lying lips, and whoever utters slander is a fool. 12. Proverbs 15:28 The heart of the righteous ponders how to answer, but the mouth of the wicked pours out evil things. 13. Proverbs 25:28 A man without self-control is like a city broken into and left without walls. 14. Proverbs 25:23 The north wind brings forth rain, and a backbiting tongue, angry looks. 15. Proverbs 25:15 With patience a ruler may be persuaded, and a soft tongue will break a bone. 16. Proverbs 11:9 With his mouth the godless man would destroy his neighbor, but by knowledge the righteous are delivered. 17. Proverbs 10:31 The mouth of the righteous brings forth wisdom, but the perverse tongue will be cut off. 18. Proverbs 26:27-28 Whoever digs a pit will fall into it, and a stone will come back on him who starts it rolling. A lying tongue hates its victims, and a flattering mouth works ruin. 19. Proverbs 26:21-26 As charcoal to hot embers and wood to fire, so is a quarrelsome man for kindling strife. The words of a whisperer are like delicious morsels; they go down into the inner parts of the body. Like the glaze covering an earthen vessel are fervent lips with an evil heart. Whoever hates disguises himself with his lips and harbors deceit in his heart; when he speaks graciously, believe him not, for there are seven abominations in his heart. 20. Proverbs 6:16-19 There are six things that the Lord hates, seven that are an abomination to him: haughty eyes, a lying tongue, and hands that shed innocent blood, a heart that devises wicked plans, feet that make haste to run to evil, a false witness who breathes out lies, and one who sows discord among brothers. What’s awful is that an angry spirit can be passed down, learned; and difficult to break free from. God bless you today. Ouch!! Just getting ready to start a new Bible Study on anger in the next few weeks. Thank you so much for this message!! I work in a room with two others. One of them gets angry all the time. It shows from head to toe. He won’t talk and he brings others down. I have tolerated this for 3 years. He is over forty I am just trying to put this to rest. I can’t stand it anymore. Suggestions? I’m sorry to her that. I, too, have experienced something similar. I ended up learning so much about myself from that person, and saw them with new eyes – compassionate eyes. What helped me? PRAYER. Lots of prayer and lots of love. It really did help. Mostly it helped me learn how to deal that kind of person. Also, though, people learn from our actions, too. If you meet anger with love, it can turn them around. I know it’s not easy – but everything and everyone we encounter is a lesson. All the best to you – Let me know how it goes!!! LOVE – Just love on this person. LOVE COVERS ALL SIN!!! ← Your Life Is Your Canvas. Paint It.